Medical Ministry International’s first project to Cambodia was in 1999. Our projects have been exclusively small surgical teams. Our principal partner has been with Southern Baptist missionaries who have established a medical care program in the country. We will continue to take teams to Cambodia and pray God will illuminate our path as we determine what our future development in the country should be. Dr. Allan B. Melicor is a General, Cancer and Laparoscopic Surgeon serving with Medical Ministry International as a Project Director throughout Asia. Allan was trained in the Philippines, U.S.A., U.K., and Japan. He lives with his wife Blessie, an RN, and son Allen Paul in the Philippines. They were introduced to Medical Ministry International in 1993 when a surgical team went to the Philippines. After volunteering that year, Allan has continued to host projects at the Bethel Baptist Hospital in Bukidnon, Aklan Baptist Hospital, Leyte Baptist Hospital & Leyte Province, Palawan Baptist Hospital and in North and South Palawan, the Tboli Evangelical Clinic and various places in Northern Philippines, as well as in Nepal, Cambodia, Thailand, and Vietnam. Dr. Eliseo"Jun" Garcia, Jr is a General Surgeon in the Philippines serving with Medical Ministry International and assisting Dr. Melicor throughout Asia. Jun has served as Project Director for the August 2017 project in Cambodia with Dr. Melicor serving as Medical Director. Baray is a rural district in the province of Kompong Thom, central Cambodia, situated along the highway that runs between the capital city of Phnom Penh in the south and the city of Siem Reap in the north. Baray district has a population of 159,000 (2002 statistics) and mostly work as farmers. Most of the population live in wooden homes that are built along the highway on top of rice paddies. Many people live with poverty and rely on their own agricultural produce for food. There are no factories in the area. There is a river that crosses the main town of Kompong Thom, which is also many people's source of fish. * Project Description: The surgical projects serve one of the poorest districts in Central Cambodia. Surgical services are almost non-existent in the village of Baray. Each year, MMI sends one of the only major surgical teams that comes to the area. We have encouraged local doctors and medical personnel join and even assist the team. This provides opportunities for them to observe how the procedures are done, how to observe sterile techniques and infection control in the conduct of the surgery. Local nurses are also given opportunities to observe how surgical nursing is done and most especially, the conduct of post operative and recovery nursing care. Sihanoukville is a coastal city in Cambodia and the capital city of Sihanoukville Province, at the tip of an elevated peninsula in the country's south-west on the Gulf of Thailand. The city had a population of around 89,800 people and approximately 66,700 in its urban center in 2008. As a result of its economic diversity, the region's natural environment, and the recreational potential, an increasing number of seasonal and permanent foreign residents make Sihanoukville one of the most culturally varied and dynamic population centers in Cambodia. Infrastructure problems persist, in particular related to water and power supply, while international standard health facilities remain limited. The urban area suffers from polluted water supplies which render tap water non-potable. Waste management policies and practices are deficient or lacking altogether. Cambodia still has one of the worst health statuses in Asia, although the situation is slowly changing for the better. The public health system has suffered from war and neglect and has had serious difficulties meeting the health needs of the population. Some government hospitals and other health units have been rehabilitated so that they are autonomous entities, staffed with qualified personnel. This has led to a significant increase in the utilization of health services. The water supply is a large problem; rivers and streams are common sources of drinking water and of water for cooking. These water sources are often the same ones used for bathing, washing clothes, and disposing of waste products. Adequate sewage disposal is nonexistent in most rural and suburban areas. Local pharmacies provide a limited supply of prescription medications, but the quality of locally obtained medications varies greatly. Sihanoukville lies in the Tropical monsoon climate zone. The city has two seasons: a wet season and a dry season. The average August temperature ranges from a high of 32°C (90°F) to a low of 24°C (75°F). Travellers must present a passport valid for a minimum of six months beyond the date of entry into Cambodia. Tourist visas are required and can be obtained at a Cambodian embassy abroad, upon arrival at the airports in Phnom Penh and Siem Reap, or at certain land borders. Tourist visas allow entry to Cambodia for 30 days only, counting from the date of entry. When issued outside Cambodia, visas have an expiry date, which refers to the date by which the visa must be used, not the length of time allowed in the country. Travellers must pay a fee of US$30 for tourist visas (cash only) and provide two passport-sized photos. Contact the nearest embassy or consulate of Cambodia or visit the Embassy of the Kingdom of Cambodia website for the most current visa information. Important: An onward or return ticket and proof of sufficient funds are required to visit Cambodia. • Americans: Cambodia offers on-line visa processing. You may also apply in person at the Cambodian Embassy located at 4530 16th Street NW, Washington, DC 20011, tel. 202-726-7742, fax 202-726-8381. Cambodian immigration officials at airports now collect fingerprints upon entry using an inkless, electronic process. The US Department of State is unaware of any HIV/AIDS entry restrictions for visitors to Cambodia. The money in Cambodia is called the Cambodian Riel (KHR). MMI staff will help you exchange money. All major credit cards are accepted - Visa and MasterCard the most widely accepted (make sure to call your credit card company and let them know that you’ll be traveling internationally). Traveler’s cheques are not easily cashed. You must bring US dollars in good condition. Torn, stamped or old bills will not be exchanged. $100 bills older than 2006 are also not accepted. 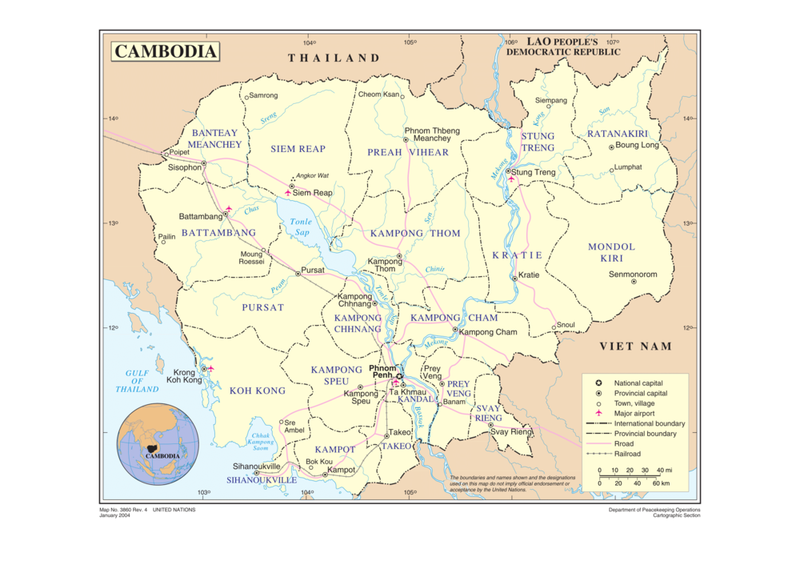 Cambodia, officially known as the Kingdom of Cambodia, is a sovereign state located in the southern portion of the Indochina peninsula in Southeast Asia. The majority of its people are Khmers, whose ancestors lived during the great Angkor civilization. The landscape of modern Cambodia is characterized by its numerous temples, monuments, churches, reservoirs, old roads, bridges, and agricultural waterways. The temple of Angkor Wat is the largest and most prominent among the thousands of "prasats," or temples, sprawling all over the country. Around 380,000 laborers and 4,000 elephants are said to have toiled for more than 30 years to complete the structural marvel. Agriculture is the traditional mainstay of the Cambodian economy, and rice is the principal commodity. Cambodia is seeking to shift its economy into more sophisticated light manufacturing, such as electronics and auto-parts.